Nibbles the book monster managed to escape from his first book back in 2016 and now he’s back munching his way through The Dinosaur Guide! Fantastically written and illustrated by award winning author and illustrator Emma Yarlett this excellent book is full of excitement. 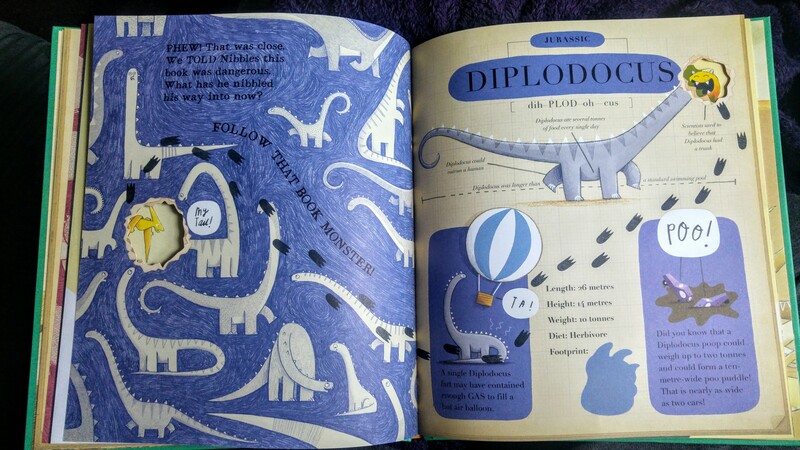 Nibbles, a wild book monster finds his way into The Dinosaur Guide! A book munching, mischief making monster, Nibbles needs to be returned to his cage. The Dinosaur Guide is full of fantastic information about different species of dangerous dinosaurs. 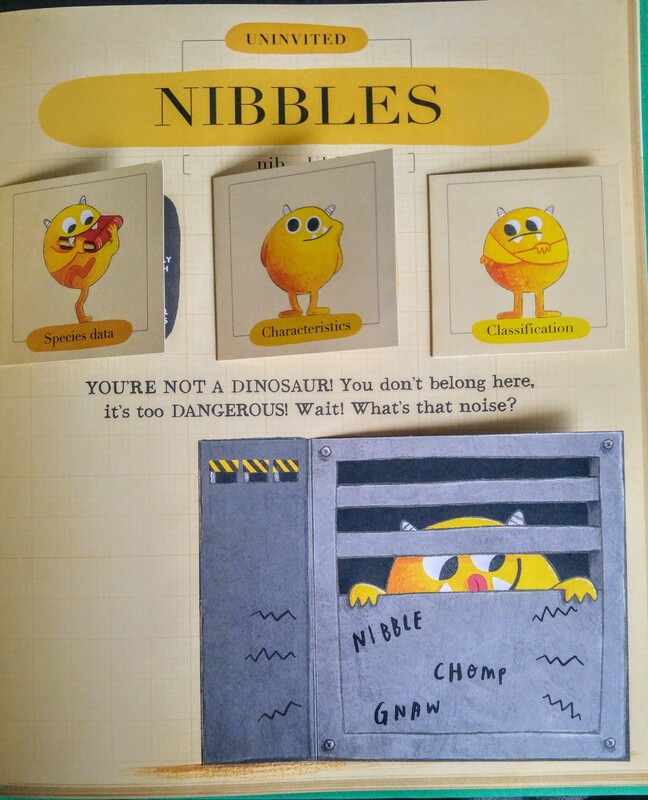 Somehow Nibbles keeps escaping whilst causing havoc, munching his way through dangerous dinosaurs throughout the book. He just about manages to nibble his way away from the terrible Triceratops, Diplodocuses and Velociraptors! Nibbles then faces the most dangerous of all, the terrifying Tyrannosaurus Rex!! This book is hilarious and so much fun to read! We loved the nibbles on the corners of the pages and holes through the pages. The book is full of fun flaps to lift too. This is such an interactive story which kept Izzy’s attention throughout. 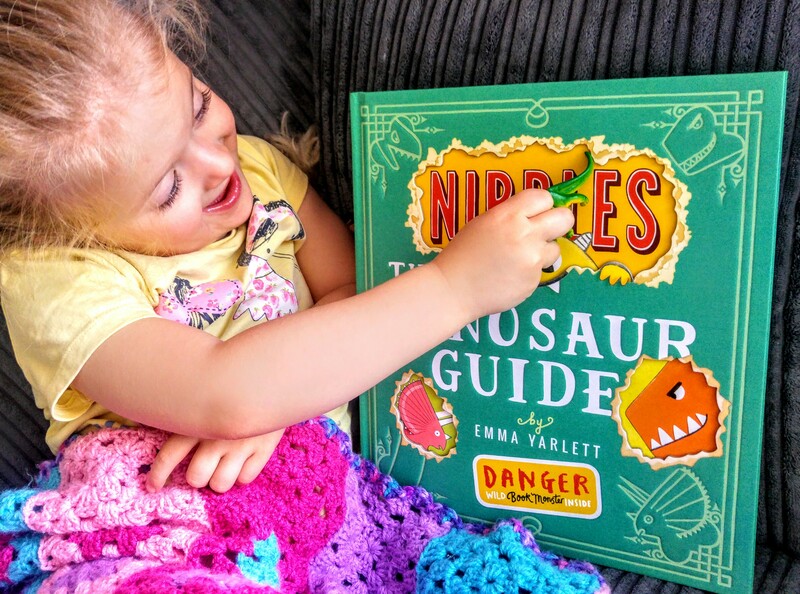 Nibbles destroys chunks of the pages but there are still plenty of dinosaur facts to learn too! I would definitely recommend this book, it is such a cheeky, funny, colourful picture book. It is bound to capture the attention of any child. Even older children will enjoy it, Eva(7) loved it as there are several amusing jokes throughout the story.